What is the connection between the Duwamish River and our local Orca? The Duwamish River is home to 5 species of salmon including the vital Chinook, which is a critical food source for Puget Sound Orca. Orca depend on the dwindling Chinook runs for the majority of their diet, and Chinook depend on healthy salmon habitat in the Duwamish. Duwamish Alive! will have volunteers working throughout the Duwamish Watershed to improve the health of our green spaces, creeks and especially our Duwamish River, which provide salmon critical habitat. Volunteers are needed at many local sites which provide critical habitat for our community and our river. Duwamish Alive! celebrates the connection of our urban parks and open spaces to our river, wildlife and community. Starting at 10:00 am, volunteers of all ages, at multiple Duwamish sites throughout the watershed from river to forest, will participate in a day of major cleanup and habitat restoration in the ongoing effort to keep our river alive and healthy for our communities, salmon and orca. Duwamish Alive! 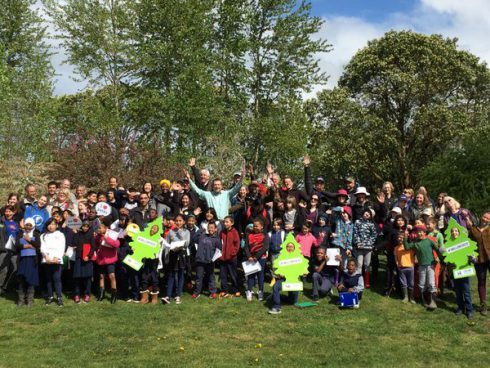 is a collaborative stewardship effort of conservation groups, businesses, and government entities, recognizing that our collective efforts are needed to make lasting, positive improvements in the health and vitality of the Green-Duwamish Watershed. Twice a year these events organize hundreds of volunteers to work at 14 sites in the river’s watershed, connecting the efforts of Seattle and Tukwila communities. To volunteer, visit www.DuwamishAlive.org to see the different volunteer opportunities and to the contact for the site of your choice, or email info@duwamishalive.org This is a family friendly event for all ages, tools, instruction and snacks are provided. Just down the hill in South Park, noon-5 pm Saturday (August 18th), and you’re invited – stop by Duwamish Waterway Park (7900 10th Ave. S.). 2 weeks to Duwamish Alive! Want to volunteer? April 7th, 2018 Tracy Posted in Environment, How to Help, White Center news Comments Off on 2 weeks to Duwamish Alive! Want to volunteer? 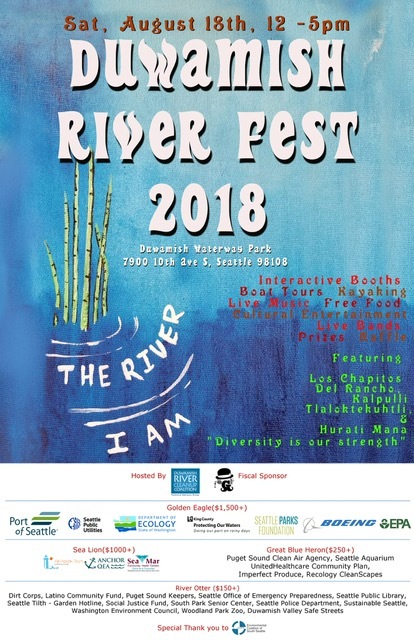 Two weeks until the twice-yearly Duwamish Alive! multi-site work party celebrates Earth Day, on Saturday, April 21st, at sites around the area. If you’d like to help, sign up fast – some spots are already full! Here’s the list, and how to volunteer. With pollution from wildfire smoke continuing to increase, the Puget Sound Clean Air Agency has put a Stage 1 burn ban in effect countywide. Here’s what that means. You might have seen these advocacy walkers passing through White Center earlier today – thanks to “Kailua Boy” for the photos. 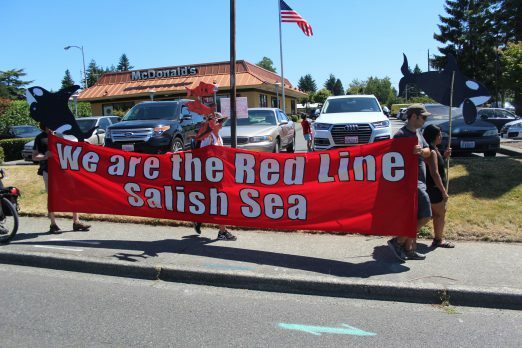 It’s the second day of the Walk to Protect and Restore Our Salish Sea, which started on the downtown Seattle waterfront Friday afternoon, stopped for the night at the Duwamish Tribe Longhouse in West Seattle, and is headed south toward Des Moines today. 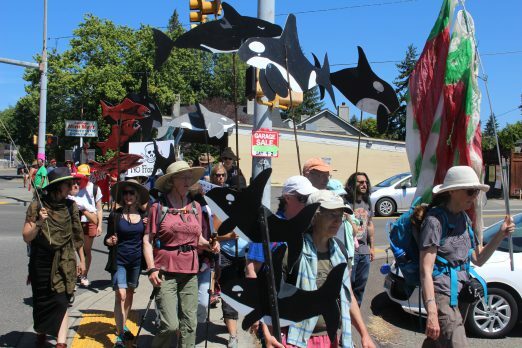 Tomorrow, the walkers head for Tacoma, where they plan to rally against a liquefied-natural-gas plant project. The group “Friends of the Trail” removed 4 truckloads of garbage (down from the last cleanup) from the site, mostly from the cell between the pedestrian bridge and SW 100th Street. At the same time, some of the vegetation was trimmed to enable easier viewing of anyone who might be hiding in the thicket. At last we have good news to report! The quantity of syringes has dropped almost in half. Many thanks to Deputy Kennamer for his diligent patrolling and enforcement of the no-trespassing areas and to King County Housing Authority for their assistance in helping keep the site trimmed and cleaned up. Here’s what the area looked like a year and a half ago. A White Center food manufacturing company, La Mexicana, has agreed to repay the state for its efforts to clean up vegetable oil that spilled into a White Center pond last year. The company has also committed to fund a local environmental restoration project. The Washington Department of Ecology, other agencies and contractors spent weeks cleaning up the vegetable oil, and catching and cleaning more than 80 oiled birds in November and December 2015. The response efforts and cleanup work totaled $333,729, and about $250,000 of this amount was dedicated to wildlife response. La Mexicana said it will pay for the bill. La Mexicana voluntarily accepted responsibility after realizing the spill had occurred at its White Center facility. The spill happened on Oct. 30, 2015, when a 200 gallon container of cooking oil accidentally tipped over and spilled an estimated 175 gallons into a storm drain. That storm drain emptied into the White Center pond a few blocks away. “La Mexicana became an involved response partner as soon as they realized the oil in the pond and the impacted wildlife were a result of the spill at their facility,” said David Byers, Ecology’s spill response supervisor. Since the spill, La Mexicana has purchased spill response equipment, posted instructions and trained employees to contain, clean up and immediately report future spills. Cooking and other edible oils, while less toxic to wildlife than petroleum products, cause environmental harm. The oil coats birds’ feathers causing them to lose insulation and buoyancy. Oil also damages habitat for other aquatic life by reducing oxygen levels and creating physical impacts on the water surface and shoreline. “La Mexicana cares deeply about our community and the environment. We are grateful that we were able to partner with the Department of Ecology to restore the pond and the impacted wildlife. La Mexicana has implemented robust programs to ensure the protection of our natural resources, and the continuous improvement of our processes, products, and services,” said William Fry, general manager of La Mexicana. Along with cost recovery, the state issued a separate $4,813.83 damage assessment to La Mexicana for harm to natural, cultural and publically owned resources. The assessment is based on the amount spilled and the resources placed at risk. Ecology also fined La Mexicana $2,000 for spilling oil and failing to promptly report the spill. Ecology penalties may be appealed to the Washington State Pollution Control Hearings Board. Other work sites include a river cleanup by kayak, shoreline salmon habitat restoration, and native forest revitalization while enjoying our autumn. Families, company groups, clubs, individuals, schools, community organizations, are encouraged to participate, and no experience is necessary. The workday at all 15 sites begins at 9:30 with volunteer sign in and concludes at 2 PM. Refreshments, tools, and instructions will be provided. All ages and abilities welcomed. 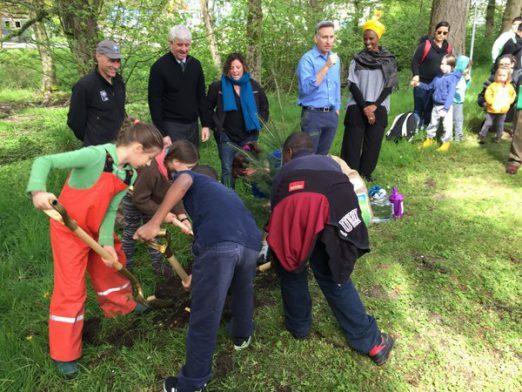 A small Douglas fir planted in White Center Heights Park signaled the start of a multi-year partnership led by King County Executive Dow Constantine to plant one million trees countywide by 2020 – an initiative to confront carbon pollution while improving the health of natural habitats and neighborhoods across the county. Executive Constantine was joined at the kickoff of the One Million Trees campaign by leaders from Forterra, The Nature Conservancy, Mountains to Sound Greenway Trust, The Nature Consortium, and The Boeing Co. – each of whom have committed to planting trees and expanding the partnership. The event served as an invitation for community groups, schools, nonprofits, tribes, local businesses, donors, volunteers, residents, cities and other public agencies across King County to participate in the initiative. Planting one million trees by 2020 is a target action in King County’s 2015 Strategic Climate Action Plan, a road map for how King County will reduce carbon pollution, increase transit, protect open spaces, and prepare communities for the impacts of a changing climate. The positive impact that trees can have on air and water quality is particularly noticeable in this region. A recent U.S. Forest Service study on the role of forests in combatting climate change revealed that, acre for acre, native Pacific Northwest temperate forests store more carbon than forestland found nearly anywhere else in the world. Earlier this year, Earth Day Network launched a global campaign to plant 7.8 billion trees worldwide, one for every person on the planet, by April 22, 2020 – the 50th anniversary of Earth Day. Thanks to Gill Loring for the photos from the White Center pond cleaned up after a cooking-oil spill, showing the birds were back just a few days after the first 13 cleaned-up ducks were returned. No way to know if any are the same; wildlife authorities told us they were not banding the cleaned-up birds or otherwise tracking them. On Monday, one neighbor reported seeing the oiled great blue heron that as of last check hadn’t yet been rescued. The Department of Ecology says that if you see any wildlife in distress – please call this hotline: 800-22-BIRDS. In our video, you see post-cleanup freedom for 13 of the birds captured at the oil-contaminated White Center stormwater-retention pond. A team from PAWS brought them back to the area and joined state and county reps in opening the carriers and watching them go free. We first reported on the pond problem a week and a half ago; last Friday, the state announced that a WC food-manufacturing business, La Mexicana, had taken responsibility. They say the pond is now clean enough for the birds to return to it safely, but they were released Wednesday morning across the street at Steve Cox Memorial Park. As you can see in the video, all 13 brought back by PAWS were mallards; crews have captured 78 in all, a mix of mallards and Canada geese. Four birds did not survive, including two that were euthanized, according to the state Ecology Department. Of the 61 birds still in treatment after Wednesday’s release, he adds, 27 are mallards and 34 are geese. All four of the birds that died were mallards. A WDFW spokesperson confirmed that this is the largest bird-rescuing operation in our state in some time, in terms of spill recovery. A food products company has voluntarily accepted responsibility for an accidental cooking oil spill that flowed through storm drains into a nearby stormwater pond. La Mexicana, Inc., based in the White Center area, has discovered that the oil came from one of its facilities. 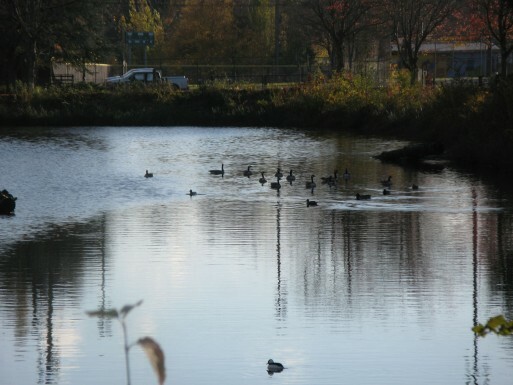 The company has agreed to pay for cleaning up the spill and rescuing ducks and geese affected by the oil. The Washington Department of Ecology has been coordinating the response effort, in cooperation with the Washington Department of Fish and Wildlife (WDFW) and the King County Department of Natural Resources and Parks, which owns the pond. A person using a walking path along the pond reported seeing oil on the water and oiled birds nearby late Friday afternoon. La Mexicana began an internal review after hearing about the spill and that it involved cooking oil. The company determined that some of the contents of a partially full container of clean salad oil, used in the production of baked goods, accidentally spilled during transport on the night of Oct. 30 at one of the firm’s bakeries, located on 16th Ave. SW. Part of the spilled oil – as much as 200 gallons – entered the county storm drain system on SW 100th St. The company made this determination on Thu., Nov. 12 and immediately reported it to Ecology, offering its full cooperation with the response and investigation. Ecology followed up with its own investigation, and verified that the accident at the company is the source of the spill to the pond. Cooking and other edible oils, while less toxic to wildlife than petroleum products, still cause environmental harm. When birds contact the oil, it coats their feathers so that the animals lose insulation and buoyancy. Oil damages habitat for other aquatic life, reducing oxygen levels and creating physical impacts on the water surface and shoreline. Ecology last week contracted with National Response Corp. (NRC) to clean oil from the pond. Crews succeeded in preventing oil from draining out of the pond, which flows into nearby Hicklin Lake. Only a few pockets of oil now remain on the pond’s surface, and NRC crews continue to tend containment boom and cleanup materials in those areas. A sub-contractor, Focus Wildlife International, has captured a total of 51 oiled birds and has taken them to the Progressive Animal Welfare Society’s Wildlife Center in Lynwood, where Focus is providing treatment. WDFW has moved its bird rescue trailer to the PAWS facility to provide additional treatment capacity. One duck was euthanized due to head injuries likely due to an animal attack. Sixteen Canada geese and 34 mallard ducks are receiving treatment at the center. Eleven of these have received cleansings and will remain under the care of Focus Wildlife until they are ready to be released. * If you see oiled wildlife, please leave it be and call 1-800-22-BIRDS (1-800-222-4737). At the message prompt, give the location, time and a description of the animal’s condition. * If you own a dog or cat, take extra care to maintain control of your pet. Oiled birds may not be able to escape when chased by animals. 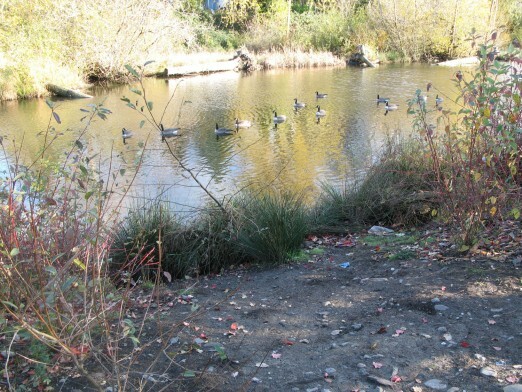 Workers made progress on Saturday and Sunday, rescuing oiled waterfowl and removing oil from the pond near 13th Avenue Southwest and Southwest 100th Street in unincorporated King County. The Washington Department of Ecology is coordinating the response, in cooperation with the Washington Department of Fish and Wildlife and the King County Department of Natural Resources and Parks. Ecology has hired a spill response contractor and a wildlife rescue organization for the cleanup. The spilled material appears to be about 50 to 100 gallons cooking oil that entered the pond via the county stormwater drainage system. County and Ecology staff have been tracing storm drains to search for the source of the spill. No additional oil has entered the lake since a citizen first reported the spill late Friday afternoon. Cooking and other edible oils, while less toxic to wildlife, still cause environmental harm. When birds contact the oil it coats the feathers so that the animals lose insulation and buoyancy. Oil damages habitat for other aquatic life, reducing oxygen levels and creating physical impacts on the water surface and shoreline. Crews from Focus Wildlife International have captured 14 oiled birds, four mallard ducks and 10 Canada geese. The birds received initial treatment near the scene in the organization’s special trailer. They were transported for further treatment at the Progressive Animal Welfare Society’s Wildlife Rescue Center in Lynnwood. Workers hope to capture approximately 20 other oiled birds, some of which have flown to other ponds, lakes or fields in the area. No wildlife deaths have been reported. Meanwhile, other workers continue to tend oil spill cleanup materials placed in the pond to collect the oil, which has spread into a slick over much of the surface. Crews succeeded in preventing oil from draining out of the pond, which flows into nearby Hicklin Lake. The cleanup has reduced the amount of oil seen on the pond over the past two days. Ecology’s contractor will measure the amount of oil recovered in cleanup materials to better determine the size of the spill. The on-site response effort, which involved 25 people on Saturday and 18 on Sunday, continues to step down to about 9 responders today. Our first report, on Saturday, is here; our Sunday followup is here. As we’ve noted previously, this county-owned area of unincorporated King County had already been the subject of extensive cleanup efforts – focused on the land, rather than the water, because of problems with encampments and drug use during the non-rainy months – here’s a report from last month, published on our partner site White Center Now. Crews are responding Saturday afternoon to an oil spill discovered in a King County stormwater retention pond in White Center. An estimated 20 to 50 gallons of what is believed to be cooking oil was found floating in the pond, which sits along 13th Avenue Southwest at Southwest 100th Street in unincorporated King County. Lab analysis of the oil will determine its exact composition. An oil-spill response team from NRC Environment was also on site this morning to contain and clean up the oil from the pond. A crew trained in cleaning wildlife was on its way to the pond to capture and clean the estimated 20 waterfowl that appeared to have been in contact with the oily water. Shorelines along the White Center pond system have been a focus of cleanup efforts, as previously reported here, but usually the problems have been on the shore, not in the water. 5:57 PM UPDATE: We’re just back from the pond, where we talked with a Department of Ecology rep; others on the scene include NRC (spill response) and Focus Wildlife, the contractor there to help with the birds. While we were there, they captured one Canada goose that had been wandering in busy SW 102nd on the south side of the scene, apparently unable to fly because of the oil. They found out about the oil because of a nearby resident who watches the area and often photographs birds; they haven’t traced the source yet but because of its smell and consistency, they’re fairly certain it’s cooking oil. What looks like a white boom around the edges of the pond is actually absorbent material intended to soak up anything that can’t be cleaned up. The responders were going to work until it got dark and then return at first light tomorrow. The rescued birds were going to be warmed in a truck on site, and then taken to PAWS for rehabilitation. Besides the wandering goose, we saw a group of ducks milling on the sidewalk along the pond’s western side; the Ecology rep said they’d been there all day. Most of the oil, he added, was on the north end of the pond. Effective immediately, all burn bans are being lifted in King, Pierce, and Snohomish counties, as well as Darrington. With the help of rain and wind, air pollution levels everywhere dropped to GOOD or lower Moderate last night. While agency forecasters do expect only light winds during the day today and into tonight, an approaching weather system should increase winds and rain late tonight and into Sunday. This will again help disperse our air pollution and keep levels low for the next 2-3 days. The Puget Sound Clean Air Agency would like to thank everyone who switched to alternative sources of heat instead of burning wood during these bans. Children, the elderly, and people with chronic respiratory health problems especially appreciate your efforts. * No burning is allowed in wood-burning fireplaces, uncertified wood stoves or fireplace inserts. Residents should rely instead on their home’s other, cleaner source of heat (such as their furnace or electric baseboard heaters) for a few days until air quality improves, the public health risk diminishes and the ban is cancelled. * No outdoor fires are allowed. This includes recreational fires such as bonfires, campfires and the use of fire pits and chimineas. * Burn ban violations are subject to a $1,000 penalty. * It is OK to use natural gas and propane stoves or inserts during a Stage 1 burn ban. Whenever the burn ban is lifted, we’ll publish an update here on WCN. In case you were hoping to use your fireplace or woodstove sometime soon – it’s now OK again. The Puget Sound Clean Air Agency has lifted the King County burn ban as of this afternoon – no current restrictions. Until 6 am tomorrow, no fireplace or woodstove use unless it’s your main source of heat – a Stage 2 Burn Ban just took effect at noon. Details here. Solar energy is currently powering hundreds of Seattle homes, and residents of West Seattle, White Center, Georgetown, Burien and other southwest neighborhoods are about to get a special opportunity to add their rooftops to our city’s growing solar array. Through a nonprofit-led program called Solarize Washington, homes and small businesses can qualify for special pricing and take advantage of many incentives that make solar installations more affordable than ever. Northwest Sustainable Energy for Economic Development (Northwest SEED) and Seattle City Light are working with several community groups to launch Solarize Southwest, a solar energy education and installation program that starts today and runs through October. The program will be co-led by a community coalition of local volunteers, which will spearhead neighborhood outreach. Supporting organizations include Sustainable West Seattle and Sustainable Burien. The campaign features a group-buy program that provides a streamlined process for residents and small businesses to purchase solar systems for a discounted price. Participants learn how solar photovoltaics (PV) works, how it is installed, what tax and production incentives are available to bring the price down, and how low-interest financing can spread out the cost. The limited-time campaign intends to install nearly one megawatt of solar energy in southwest Seattle and Burien by the end of 2014. Through a competitive bidding process, community volunteers selected Puget Sound Solar and Artisan Electric as the project’s solar installation team. These contractors will offer solar systems at discounted rates to project participants. Solarize Southwest will be the tenth campaign of Northwest SEED’s Solarize Washington program. To date, Solarize Washington campaigns have resulted in over 2 MW of new solar capacity, over 2,000 people educated through public workshops, 475 residents who installed solar on their homes, and more than $12 million injected into the local solar economy. The last Solarize campaign, Central/Southeast Seattle, was so successful that 885 kW of solar photovoltaics was installed on the grid and over 620 people attended workshops. Solarize Southwest is the third campaign sponsored by Seattle City Light, and momentum is already building to make this campaign even more successful than the last. Registration for Solarize Southwest is open to Seattle and Burien residents who live in the geographic area bordered by downtown Seattle to the north, I-5 to the east, and within Seattle City Light service territory. Free educational workshops will be held on Jul 19, Jul 24, Aug 9, Aug 26, Sept 10, Sept 17, and Oct 4. For more information and to pre-register for a workshop, visit solarizewa.org. Bring (up to 4 boxes per person) of paper you would like to have securely shredded. In addition to the shredding, we’ll be open to show the community all the great things PB&J brings to White Center. Plus, stop in for a special PB&J ice cream cone from Full Tilt Ice Cream. We’ll have goodie bags, drawings and other fun activities. Here’s a Facebook event you can join if you’ll need a reminder!